The Little Giant 10-Frame Deep Hive Body with Frames is pre-assembled for easy setup and use, including pre-installed wax-coated black plastic foundation for easy viewing of hive activity. Made of unfinished pine, the Deep Hive Body can be used as either a Brood Box or Honey Super and is precision-milled for maximum strength. Ready to be added to your hive right out of the box! 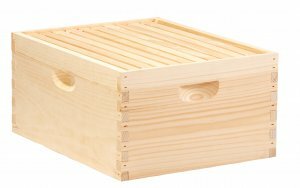 Includes: 10-frame 9.5-inch deep hive body, 9.125-inch wooden frames with wax-coated black plastic foundation.